The Shearwater Teric. Photo by Michael Menduno. Named after Pterodactyl or Pteric (a flying dinosaur from the Late Jurassic), the “P” is silent. It’s the perfect device to pair with your Shearwater Perdix or other dive computer (DC) for tekkie redundancy, or to use all by itself. Note that Shearwater’s last two DCs were named after birds. The powerful little computer offers a full range of diving modes: Open Circuit (OC) Rec, OC Tech, Closed Circuit Rebreather (CCR), Gauge, and—yes, hold your breath—freediving. In fact, about the only thing it is missing for aquaphiliacs is a swimming mode. However, Shearwater’s marketing maven Gabriel Pineda told me that a swimming mode was a distinct future possibility, given that it is just a matter of software. I originally acquired the Teric for a freediving class, where it performed brilliantly (I, on the other hand, still needed work on my Frenzel—hint: It replaces Valsalva when you are upside down holding your breath). So, I was excited to put it to work on a technical dive for the first time last week. It did not disappoint. The display is bright and highly visible, thanks to the new active matrix organic light-emitting diode (AMOLED) technology—the same used in the new Samsung and Google phones (the Perdix uses an older color LED display technology, as does the new iPhone XS Max). I could read it clearly without my prescription mask. The four-button interface is a snap—totally intuitive. 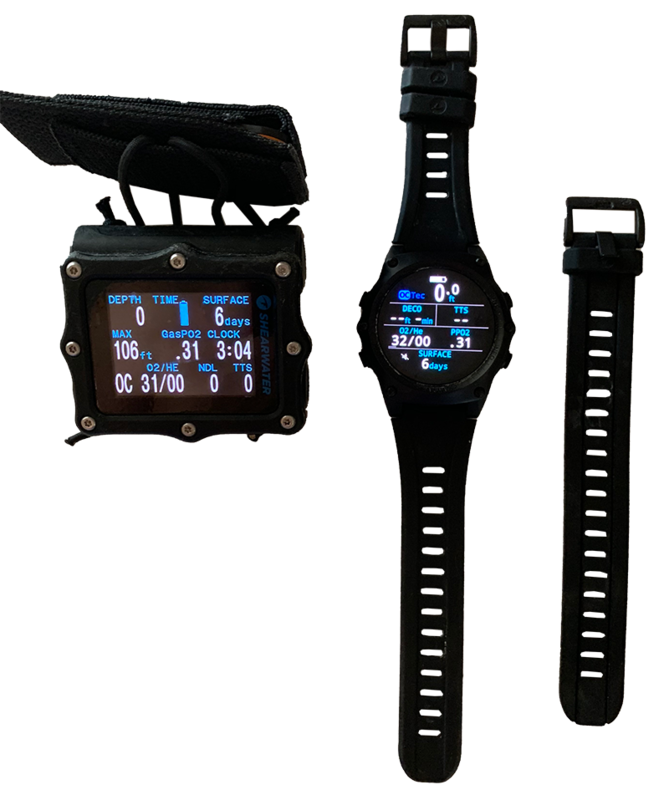 And it has all the features of its bigger Shearwater predecessors: Bluetooth, cloud, air integration (AI), digital compass, stopwatch, easy underwater gas switching, and changeable watch faces. What’s more, the watchband extender makes it easy to go from the office ladder to the swim step with aplomb. Think Perdix in a very small package. For tekkies, and likely reccies too, Teric is a no-brainer. But I suspect that Shearwater will begin making a big splash in breath-hold computing, which is currently dominated by companies like Suunto and Oceanic, though Garmin is generating substantial buzz with its Descent Mk1 all-in-one dive computer. Word is that the diminutive computer has even garnered attention from the judges at the International Association for the Development of Apnea (AIDA), one of the international federations that oversees freediving competitions. Here’s why: The freediving Teric offers the necessary high-resolution sampling rate (4x/sec); time and depth haptic and audio alarms—so you know when to take that mouth fill and/or when to reach for the plate; and a brightly lit display with all the right information: last dive, max depth, surface interval, ascent and descent rates. Can a “technical” freediving (i.e. mixed gas) freediving mode be far behind? Watch this space!